Align and Shine (Alignment Yoga) was an all-levels yoga class in Durham. From 2011 to 2017, this space was an exciting, uplifting, and fun-filled opportunity for new and experienced yogis to expand the limits of their physical and spiritual practice. After many years of devoted practice, this class ended on 8/26/2017. Align and Shine (Alignment Yoga) is an all-levels yoga class in Durham. Since 2011, this space has been an exciting, uplifting, and fun-filled opportunity for new and experienced yogis to expand the limits of their physical and spiritual practice. In every class, we explore a heart-centered theme which weaves together the physical, spiritual and energetic threads of existence for a joyful exploration of embodiment–including the opportunity/option for a (supported) handstand, as well as heart-opening back-bends and centering breath and meditation. This 90 minute class is a time to build your personal practice while you build community. All are truly welcome. If money is an obstacle for you, please contact me — I am committed to supporting your practice if that is your desire. Durham Yoga Company, 502 Rigsbee in downtown Durham. This is an awful time. Many of us are still reeling, still cycling through trauma and grief responses. This is absolutely understandable and totally appropriate – get what you need in this time! Many of us also need spaces that help us accept the truth of what is right now, and help us practice interrupting the kinds of oppression and violence that are increasing in this era. We need practices which help us understand our own fear responses, for understanding how to gauge safety vs comfort, and for increasing our capacity for engagement. In order to challenge the white supremacist ideology that we have a right to be comfortable and an obligation to be polite, we must examine how that lives in our bodies and shows up in our relationships – towards the end of developing skills and tools which can increase our capacity to engage in a variety of situations – from interrupting “casual” incidences of oppressive language to more aggressive forms of discrimination, antagonism, and violence. -Encourage folks to understand what bold and courageous action looks like for each of us right now, and figure out ways to support that going forward. Open to all. No movement/yoga experience needed. By Donation. Proceeds will go to support local People of Color-led racial and economic work, and to Triangle SURJ, which has a Resource Steward Team, a mixed-class team making decisions about how to manage the resources that flow in to and out of TSURJ in accordance with values and relationships of accountability. Details of the disbursement of proceeds will be published on this event page following the event. A small portion will go to the lead trainer to support her livelihood. Please wear comfortable clothing suitable for movement. Host and Lead Trainer Patty Adams organizes locally with Triangle SURJ, a multiracial coalition to bring white folks into the struggle for racial justice. She is also an experienced yoga teacher, psychotherapist, facilitator and anti-oppression trainer. She is offering this workshop in the spirit of taking bold action and encouraging others to do the same. More about Patty at Liberation Healing Arts. Co-host and Co-trainer Kristen Cox also organizes with Triangle SURJ and has years of experience in embodied practice including dance and other forms of conscious embodiment and cultural organizing work. The response to our first yoga + social justice retreat was so powerful and so positive…we’re bringing it back! To build on the power of collective connection, this time it will be in two parts, plus an optional meet-up in between. Plus optional meet-up on December 17, 2016. Are you ready to explore radical ways of loving, organizing and being social change agents? In this multi-part workshop we will focus on the lessons from yoga to create sustainable, accountable, trauma-informed social action and change in the world. The unique format includes an introductory weekend plus a daylong follow-up, along with an optional meet-up midway in between. This multi-stage process allows us to continue to build community, to reflect on the lessons learned, and to support the ongoing integration of the material on the embodied, interpersonal, collective and societal levels. Understand the role of embodied practice in social justice work. Understand the principles of trauma stewardship and trauma-informed therapy. Deepen your understanding of radical self-care. Explore themes of suffering and liberation, our own and others. The group who gathered in April for Radical Listening, Radical Love. This workshop is for everyone interested in exploring the intersections of trauma stewardship, yoga, and social justice. We hope that it draws a diverse group of people, as it is not exclusively for yoga teachers or therapists. Further, no yoga experience is required, though some familiarity with physical yoga (asana) is beneficial. In order to build a strong container for the work, we expect all participants to commit in good-faith to attending all days/all sessions, including the whole November weekend and the January follow-up day. [December meet-up day is optional but encouraged.] We are not offering partial enrollment or drop-in options. Additionally, we will be capping enrollment at around 14-16 people. Fellowship stipends available to support the participation of People of Color, queer/LGBTQIA+ folks, and poor + working class folks. Payment plans and work-study positions available – email Patty directly for information. CEU’s available for yoga teachers upon request. Final payment will be due November 4th, except for those who arrange payment plans. *While we will waive the deposit for folks receiving Fellowships or Work-study positions, we do ask folks to be respectful and responsible with registration – series inquiries only! Patty Adams has been studying yoga for 13 years and teaching for more than ten, much of that time dedicated to the study of Anusara Yoga under certified teacher BJ Galván and formerly certified teacher Paul Sobin. She came to yoga and healing arts work after many years in social movement spaces, realizing that the hard work of struggling for justice, equity, and liberation takes a toll on all those who are committed to carrying it out. Since moving to Durham six ago, Patty has explored the intersection of social movement and healing arts work in many ways, primarily through her commitment to donation-based yoga and sliding scale bodywork, especially with those on the front lines of social movement/social service work as well as members of the Queer/LGBTQIA+ communities. Patty is an E-RYT 200hr Registered Yoga Teacher, and is pursuing her 500hr certification as well. Her dynamic teaching style and fun-loving personality help her students find the fullest expression of themselves and their hearts even as they laugh, build community, and transcend their own expectations of themselves. She is founder/teacher of Yoga for Queers and Misfits, a donation-based yoga space for queer, trans, gender nonconforming, big-bodied, hairy-bodied, counter-cultural, and otherwise ‘othered’ folks. Patty received her Masters in Social Work from NC State in May 2016, and is a provisionally-licensed clinical social worker. As a social worker, Patty serves members of the queer and trans communities and immigrant communities, and strives to provide accessible and competent care in a community mental health setting. Explore the rest of this site to learn more about Patty. Michelle Johnson is a 500hr Registered Yoga Teacher and teaches yoga in and around Carrboro/Chapel Hill, North Carolina. Yoga has transformed her life and she feels honored to be able to share her love of yoga with the community. Michelle is passionate about individual and collective transformation. She believes that moving in the body through the practice of yoga, becoming still in the mind through the practice of meditation, and learning to control the breath through pranayama, leads to transformation physically, emotionally, mentally and spiritually. Most often, Michelle teaches a flow style class, linking the breath with the movement, in addition to being certified to teach flow/vinyasa yoga, Michelle has received certification to teach Yin Yoga, Yoga to Manage Your Mood and as well as studied various mindfulness and meditation techniques. Michelle received her 200hr certification in Power Yoga from Franklin Street Yoga in Chapel Hill and went on to study with Stephanie Keach of Asheville Yoga Center to complete her 500hr teacher certification. She has studied with Baron Baptiste, Michael Johnson, Tara Brach, Faith Hunter and Shala Worsley. She has had the pleasure of teaching with Sage Rountree, M.C. Yogi, Carrington Jackson, Dani Leah Strauss and many others. Michelle is an ambassador for the Africa Yoga Project and has traveled to Kenya four times to volunteer with the project. Michelle’s dedication to teach and live yoga comes from the belief that our collective liberation and suffering are intertwined. Michelle wants to encourage people to move back into the body in a safe and authentic way and to not only create space for themselves through the breath and practice of yoga but to also understand how they can live their yoga. The transformation that she encourages is expansive and moves beyond the four corners of the mat or the circular shape of a cushion. In addition to teaching yoga, Michelle is a clinical social worker and has been in private practice in Chapel Hill and Carrboro since 2001. In her private practice she works with people who have been disembodied by trauma and oppression. We live in a world that is both full of love and liberation and continual suffering. Michelle believes that we must explore and understand our relationships to power and privilege and liberation and suffering so that we can better understand our response to the toxicity in the culture. Literally, we must change the air that we are breathing in and understand that the practice of yoga and the practice of the breath leading the movement are radical acts. In all of Michelle’s work whether it be as a yoga teacher, student, leader, elected official or therapist she leads from the heart. Go here for more: Michelle Johnson Yoga and Michelle Johnson Therapy. What is the relationship between your practice and the suffering of the world? The tools of yoga are designed to foment liberation, resilience, and connection; we can skillfully use them or we can sorely abuse them. Our practice is either essentially selfless or it is utterly senseless. It either serves everyone or it serves no one. We have to choose. We get to choose. Which choice will we make? Sunday, 8/28/16 at Durham Yoga. 12:30-2:30, followed by an optional Veggie-friendly potluck from 2:30-3:30. $25 / $20 Earlybird – book by 8/22. Show up for a joy-filled afternoon of asana (postural) expansion, with the help of yoga assists. Yoga assists, when skillfully applied, offer the practitioner an experience of deeper stability and greater freedom. We’ll explore these hands-on enhancements together, with clear guidance, supporting one another as we playfully challenge our limits. Patty Adams and Mira Shani will co-teach this workshop, which will include 90 minutes of partner-enhanced asana, followed by 30 minutes of deeply therapeutic restorative work. After class, join us for a veggie-friendly, community potluck, 2:30–3:30 p.m.
Anti-racist yoga convergence, Sunday July 24th, 1-3pm. Go here for more. Celebrate Spring with a FREE, outdoor yoga class with me. Duke Chapel Quad. Bring your own mat if you’ve got it – I’ll have some too! Remember I’m on sabbatical for May and June so this is one of your last chances for yoga with me until July! In this weekend workshop we will focus on the lessons from yoga to create sustainable, accountable, trauma-informed social action and change in the world. Understand the principles of trauma stewardship and trauma informed therapy. This workshop is for everyone interested in exploring the intersections of trauma stewardship, yoga, and social justice. We hope that it draws a diverse group of people, as it is not exclusively for yoga teachers or therapists. Further, no yoga experience is required, though some familiarity with yoga may be beneficial. In order to build a strong container for the work, we expect all participants to commit in good-faith to attending all days/all sessions. We are not offering partial enrollment or drop-in options. Additionally, we will be capping enrollment at around 14-16 people. Tuition: Between $200-$350, which includes 14 contact hours plus two lunches. One work-study position available (email Patty directly for information). To reserve a space we require a $25-$50 deposit. If you need to cancel and do so by April 8th, we will refund your payment minus a $10 service fee. If you need to cancel after April 8th, we will refund your payment minus the deposit you paid. Full payment is due a week before the workshop, by April 15th at 5:00pm. If you need to request a payment plan you may do so in the registration form. We accept credit cards, checks or Paypal. If for some reason you need to cancel, please let us know by Friday April 15th, so that we can offer your space to another person. We will send you details for how to make your deposit, per your preferences indicated in the registration form. Your registration is not guaranteed until we receive your deposit. Patty Adams has been studying yoga for 13 years and teaching for more than ten, much of that time dedicated to the study of Anusara Yoga under certified teacher BJ Galván and formerly certified teacher Paul Sobin. She came to yoga and healing arts work after many years in social movement spaces, realizing that the hard work of struggling for justice, equity, and liberation takes a toll on all those who are committed to carrying it out. Since moving to Durham six ago, Patty has explored the intersection of social movement and healing arts work in many ways, primarily through her commitment to donation-based yoga and sliding scale bodywork, especially with those on the front lines of social movement/social service work as well as members of the Queer/LGBTQIA communities. Patty is a 200hr Registered Yoga Teacher, and is pursuing her 500hr certification as well. Her dynamic teaching style and fun-loving personality help her students find the fullest expression of themselves and their hearts even as they laugh, build community, and transcend their own expectations of themselves. 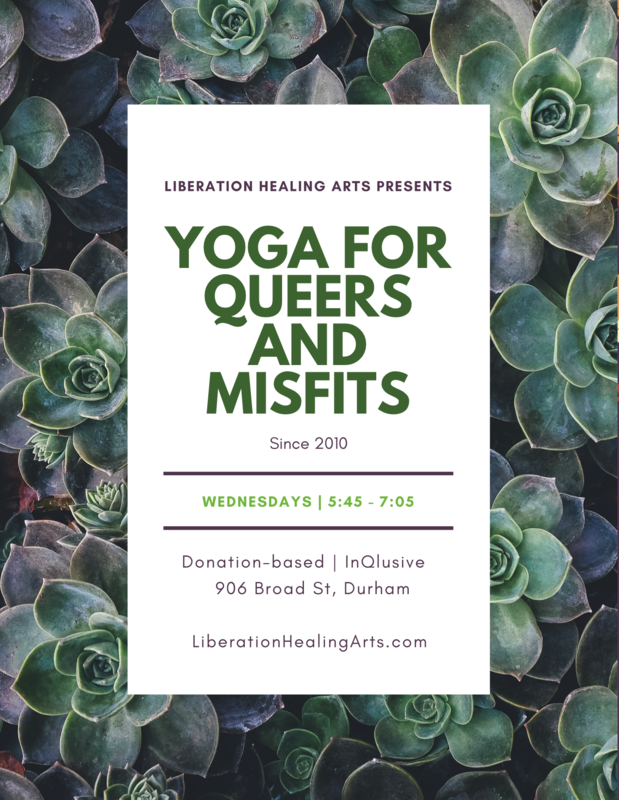 She is founder/teacher of Yoga for Queers and Misfits, a donation-based yoga space for queer, trans, gender nonconforming, big-bodied, hairy-bodied, counter-cultural, and otherwise ‘othered’ folks. Patty will receive her Masters in Social Work from NC State in May 2016, and will pursue licensure in clinical social work. As a clinical social work intern, Patty has served members of the queer and trans communities and immigrant communities, and provided accessible and competent care in a community mental health setting.